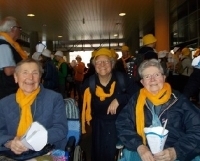 Sr Mary Annette (Jean Mary Dahlberg)was born in Warkworth, New Zealand and was of mixed Dalmation/Bohemian descent. She was one of a family of 4 girls. By all accounts her early years were the foundation of her life built on hard work, practicality, kindness, understanding and deep spirituality. And her earthy sense of humour! She left home on 5 January, 1936 to enter the novitiate and made first profession at Heretaunga on 15 August, 1939. Later that year she was missioned to Tonga. So began her great love of Tonga and its people. 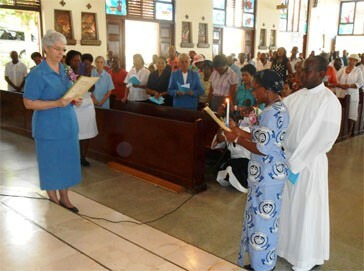 Over the years she taught school, was provincial bursar, Bishop’s secretary, helped as diocesan financial administrator and was local superior in many communities. She did teacher training at Loreto Hall (Auckland) in the 50’s and attended EAPI in the early 70’s. 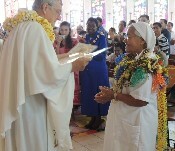 As well as working in Tonga, Annette did various stints in New Zealand working for the Tongan chaplaincy. Her love of gardening was legend. 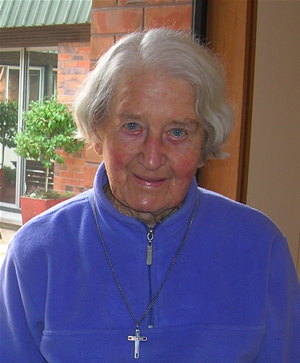 In her eulogy, Sr Josephine Gresham said: Sr Mary Annette was a keen gardener. Even her bedroom was a private little hot house of bits and pieces set aside to sprout and bloom, talked to lovingly each day and cared for with special attention. She loved to make things grow, both people and plants. In her days as a teacher she tended the soil of students’ minds and planted the seeds of knowledge. 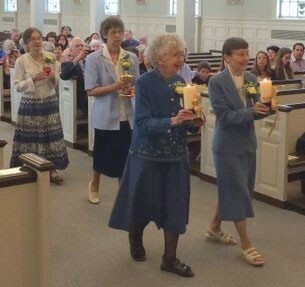 As a result many of those students have done well, become leaders in society and in the Church, their children and their children’s children continue to hand on the faith and values Sr Mary Annette planted among them all those years ago. 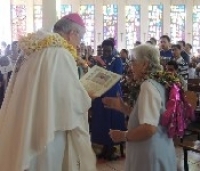 Sr Mary Annette’s knowledge of Tongan families and their history was well known. She could link people and follow family ties through generations. She introduced many people to family connections and could always be relied upon to know blood lines and connections. Even after she left Tonga, Annette always kept in touch with what was going on there, both in the Church and in politics. She had her opinions on all that went on and was not backward in letting you know that she thought. 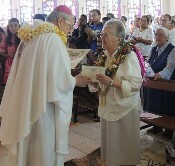 Her 60 year connection to Tonga and its people was strong and never lessened. Sickness and old age were a great cross for Sr Mary Annette, especially when she could no longer work in the garden or do things for herself. She struggled to let go and accept her need to be cared for. For her, article 24 of our Constitutions became a reality: Called to live the paschal mystery in times of suffering, sickness and old age as well as in times of success, health and activity, we always share in the mission of the congregation. Sr Mary Annette went home to God peacefully on the morning of 20 July, 2007. She died as she had lived, steeped in trust and faith and ready to welcome the unexpected.